If you love modern technology, but like your technology to have a more vintage look, you can generally find a way to create what you’d like. The internet is a wonderful place full of ideas, and people with great ideas; like Steve M. Potter. Steve always liked the tactile clicking sound of the buttons on old keyboards like the IBM-AT, but dislikes the beige plastic aesthetic, so he decided to make a wooden keyboard out of one for himself. He says the “buckling spring” mechanism of the old keyboards are sturdy and last a long time. (Sturdy enough to even withstand dozens of kids pounding on it at the Maker Faire in Atlanta where he had it hooked up for people to test.) For Mac users, you can get a brand new buckling spring mechanism keyboard from Unicomp, the Spacesaver M, which will work with this project. 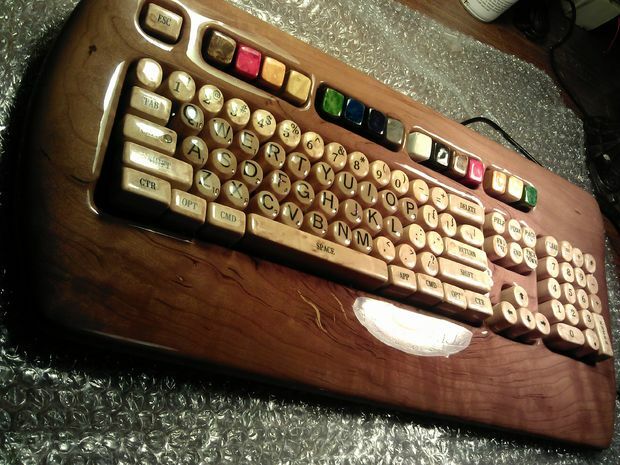 He used Scrabble tiles for the letters which he cut out and glued to the circular dowels he made for the keys, and even used wood dye to match the resistor color code of the function keys!